I've been slow to get around to this, after figuring out how to install EOS Utility without a CD on my laptop and realizing I could control my Canon T5i from my computer using a USB and actually shoot from my laptop. It's cloudy again tonight, but my 6 foot USB arrived in the mail so I wanted to test it out. My camera uses USB A to mini-B (not micro B like an Android phone, and not a regular B like a printer, but a mini-B). My original theory was that I would have finer control of manual focus using the EOS Utility software to make little tiny incremental changes. However, even the fine focus arrow seems to shift or stick and jump a little (could be my kit telephoto lens), but using my live focus technique I'm actually able to achieve similar results. I think where this will really come in handy is with solar photography, because I'm unable to touch the manual focus while my DIY solar filter is over the lens. Being able to manually adjust the focus via my laptop would be a big help to focus in on those hard to see sun spots. It's hard to tell whether or not the single frame is better than what I get with autofocus on the moon. 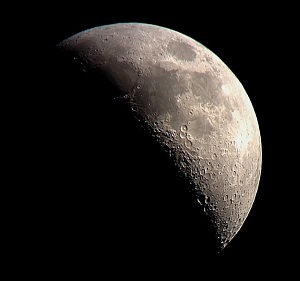 The moon is very hard to shoot with manual focus because the craters don't give the same feedback as a star. By that I mean when you focus on a star the goal is to get the dot as small as possible to know that you are in correct focus. 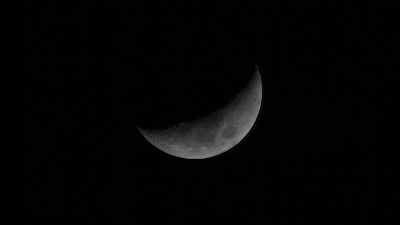 With the moon, there's no absolute way to tell on a tiny LCD screen on the back of the camera - so shooting the moon might actually be better with the camera paired to the laptop to look for incremental improvements. 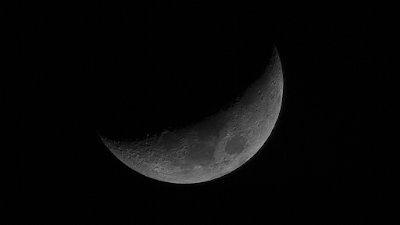 Not bad at all for a single frame, considering I was shooting between clouds too. Some better seeing and this might be a way to increase my moon quality without upping my lenses. Below is the final photo, stack of 3 frames with the usual post processing. I actually had to Google my high pass method to remind myself - has it really been that long? ?